Common in many timber boards. Introduced by Midget Farrelly in foam boards 1965 for weight reduction. 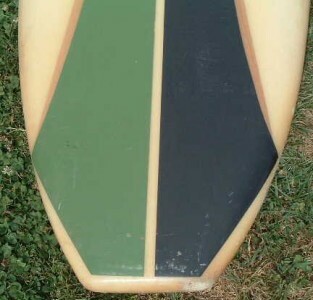 Unusual, notably used in the Featherlite model by Hansen Surfboards, USA circa 1967. One thick stringer laminated between two thinner stringers - the ' T' indicating a total of Three. One thin stringer laminated between two thicker stringers - the ' T' indicating a total of Three. Unusual in surfboards but common in sailboard blanks to allow support for the mast-track and finbox inserts. Multi stringers, not parrallel to the centre line. A mostly straight stringer that curves out to the rail line at one end. Multi stringers that twist or cross. Extremely rare. Not real stringers but timber inserts added post production, usually to repair and strenghten broken/cracked boards. timber beam inserted into a blank to add structural strength. Originally used in solid wood boards after WW I to maintain strength while incorporating lighter timbers such as balsa, see Pacific Homes Systems. With the introduction of fibreglass, stringers were not considered essential in an all balsa wood blank, but reappeared when foam blanks were developed, credited to Hobie Alter (USA),1957. The stringer added strength and also gave the shaper and the glasser/decorator a line of symmetry on the all white blank. Post-foam balsa boards adopted stringer use : multi-stringer placement can be used to balance the board and stringers are invariably attractive. See also glue line, T Band. were usually glueups of four or more blocks. glue line a resin line joining sections of the blank as a lightweight alternative to a wood stringer. It alsousually serves to provide the shaper with a line of symmetry – contrast difficulties with a stringerless blank. Mostly used from about 1967 to 1972 for weight reduction. - Kelly: Surf and Sea (1965). Twin flared stringers circa 1965. Tim Clarkson, Victoria, January 2006. My father in law says he got it second hand in 1967. He bought it of a workmate's mate in Camberwell Victoria. It already had a couple of dings and that the fin had already been replaced. Note that the 'stringers' are inlayed and do not extend through the blank. The bottom has a single straight centre 'stringer'. In detail image, right, the 'stringers' are taped and do not extend into the rail. Geoff Cater (2004-2013) : Appendix : Stringers.